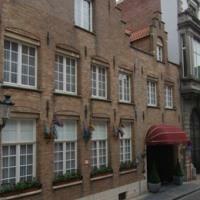 The hotel is one of the most beautiful family run hotels in Brugge - Bruges. It is located in an elegant 17th Century (listed) building that was renovated in 2006 and retains much of its original charm. It is also the place where the famous physician Anselmus Boetius De Boodt once lived. The hotel has a reception area with 24-hour service, a hotel safe, breakfast room, publicly available wireless Internet access and bike rental as well as covered parking, both of which cost a fee.The en suite rooms have a hairdryer, direct dial telephone, satellite/cable TV, radio, safety deposit box and Internet access.For arrival later than 23:00h, please contact the hotel to make arrangements.